Note: This chapter describes working with Sub-queries used in criteria expressions to limit result dataset (in WHERE, HAVING and SELECT clauses). 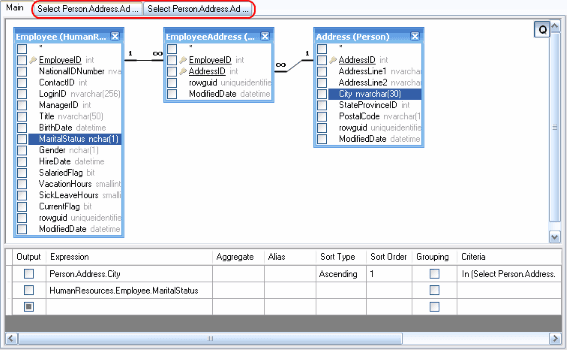 To find out how to work with sub-queries used as datasources for the main query (i.e. in the FROM and WITH clauses), please refer to the Derived tables chapter. You can add a sub-query as part of the expression or condition in the Columns Pane while editing text in a cell. To add a sub-query, right click at the text position for a new sub-query and select the Insert Sub-query item from context popup menu or type the "(Select)" text to the Expression column, the "= (Select)" or "In (Select)" text to the Criteria column. Please note that curly brackets are necessary. To build a newly added sub-query visually, confirm editing by pressing the Enter key. The corresponding tab is created above the Query Building Area and the ellipsis button will become visible at the right side of the cell (*). By clicking the ellipsis button, you'll be switched to a sub-query tab where you can build it visually in the same way as the main query. If the cell contains more than one sub-query, the drop-down list will appear to select the necessary sub-query. (*) The ellipsis button appears only in the VCL and ActiveX Editions of Active Query Builder.